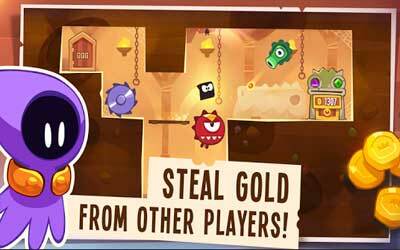 This is old version King of Thieves 2.11.1 apk for Android, you can install it if you want to downgrade or install old app. It is top Strategy apps from ZeptoLab. This place is important that affect everything in this game, so you have to make sure security level is on high level. Beside gold, there are totem and gem that help player for upgrading and increasing protection mode. From beginning, you will receive gems then expand into bigger base operation and gold possession. The goal in this game is not collecting gems and gold but also reaching king of thieves’ position. When another player breaks a door, you have several options to prevent him to steal your gold. Totem acts as weapon that can be activated to give powerful method to preventing that situation. Another way is making sacrifice to let other steal a little gold from you. All of them are the best part of game so you have to install at smartphone or tablet. Developer focuses on android OS users because this segment has huge number and potential for King of Thieves for android. GUILD BATTLE SEASONS. Win the most guild battles during the season to get your hands on huge rewards! Get to the top to win this season’s unique outfit. DYNAMIC TRAP TOOLTIPS IN EDITOR MODE. Long tap on trap to activate tooltip mode. To reach overlapping traps, tap on corresponding tooltip will open upgrades window.